Am I the only one already thinking of Cinco de Mayo? ?? Or everybody else’s main concern right now is also what are you going to serve with your Margaritas? ? So, go ahead. Send out those party invitations because I’m going to help you throw the most amazing Cinco de Mayo fiesta. We already established that the Margaritas are a given. Now, we need something ridiculously delicious to kick off this fiesta. 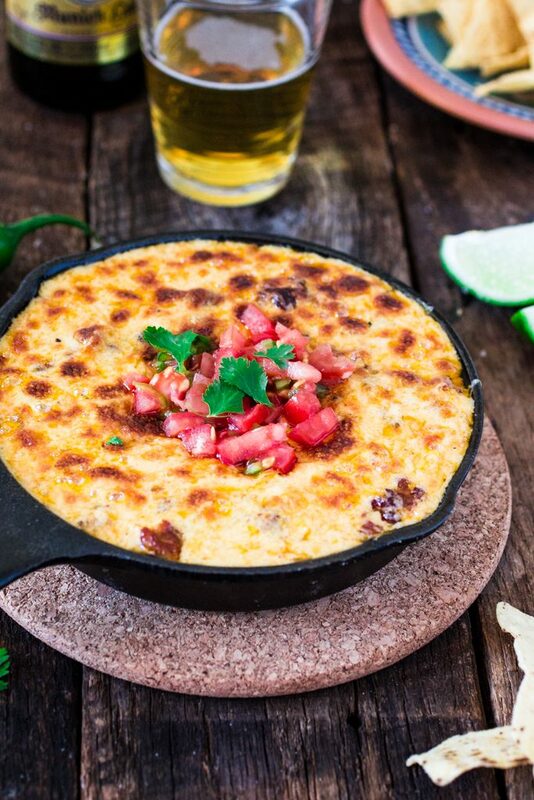 And what could be better than Mexican Queso Fundido with Chorizo? I’ll answer that for you: absolutely nothing! At least not in my cheese-maniac world. This ooey gooey melted Queso is truly one of my favorite things in the world. I guess this is no surprise, since I’m also very much obsessed with cheese fondue and melted brie. And now that I think of it, I can trace this melted cheese obsession back to my early teenage years, when I would pop a few slices of cheese in the microwave for it to melt, and then eat it with French rolls. Or, more often than I’d like to admit, just devour the whole thing with a fork! The habit didn’t die down, on the contrary. I became this adult (Adult? I just wanna burst out laughing right now!) who prides herself on home cooked, gourmet dishes. So now, instead of melting cheese in the microwave, I do it on the stove. With beer. And then I top it with spicy chorizo and pico de gallo salsa. That, right there, is proof of human evolution, my friends! ??? 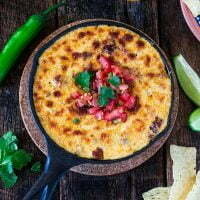 Now, authentic Mexican Queso Fundido (which means molten cheese) is usually made with Chihuahua, Asadero, Menonite or Manchego cheeses, but they are not so easy to find here in the US. I used a combination of cheddar cheese, Monteray Jack and Oaxaca. If you can’t find Oaxaca, just substitute it for some good old Mozzarella. I also realize that some purists might think my queso is too yellow, since Mexican Queso Fundido is traditionally made with white cheese. But I simply couldn’t resist adding some sharp cheddar in there! If authenticity is a concern, just use all Oaxaca, but know that you will be missing out on some amazing flavor! Finally, I recommend you serve your queso immediately for the best stringy/melty consistency. If you want to prep ahead, go for it. Prep and cook your onions and chorizo, make the salsa and shred the cheese. But leave the stove (and broil) magic for show time! Lots of recipes say that you can make the queso ahead and reheat it when ready to serve, but I find that although the flavor is the same, the texture is not. 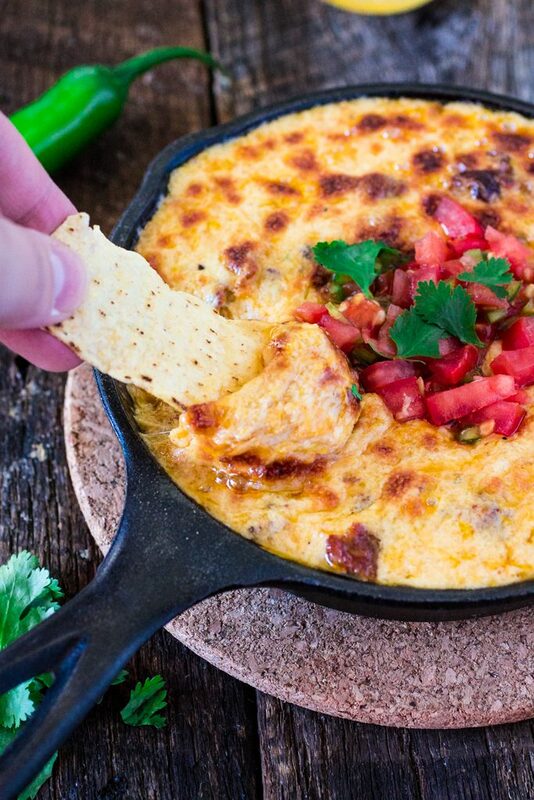 I always serve my Mexican Queso Fundido as a dip, with tortilla chips. In Mexico, they spoon their queso into soft tortillas. Either way, it will taste delicious and I’m sure it will be the star of your fiesta! In a small bowl, mix the tomato, serrano chile and cilantro. Season with salt and let it stand for at least 30 minutes, while you prepare the queso. In a medium bowl, toss the grated cheeses with the flour. Reserve. Add the olive oil to a medium-sized skillet and bring it to the stove over medium heat. Cook the chorizo, breaking it up with a wooden spoon, until it starts to brown, about 2 minutes. Then, add the onions and continue cooklng until the chorizo is fully cooked and the onions are soft and translucent. Remove (with a slotted spoon) from the skillet into a separate bowl. In a medium cast iron pan, over medium heat, add the beer and let it simmer. When simmering, start to add the cheese, slowly. Whisk constantly and only add the next handful of cheese once the previous one has melted. Optional: For a bubblier version with some delicious browned spots, simply pop the queso into the (preheated) broil for about 5 minutes. Check often to prevent the cheese from overcooking. Using a slotted spoon, spoon the salsa over the queso. 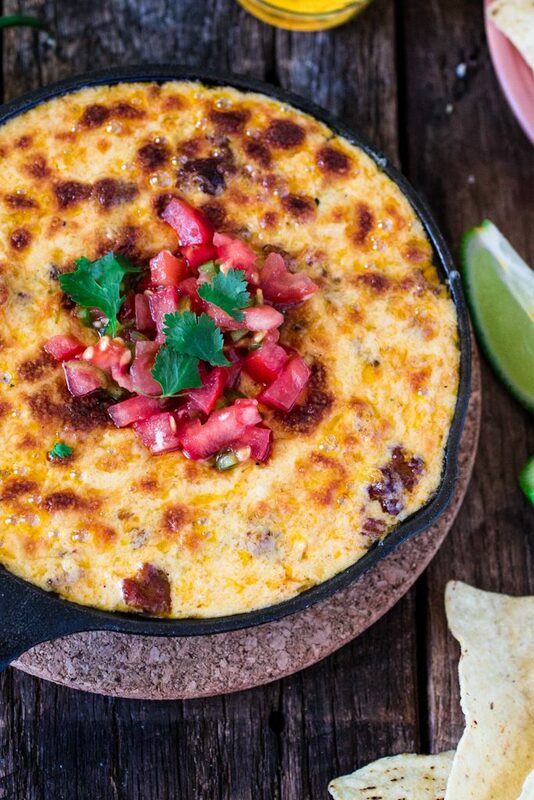 Serve as a dip with tortilla chips or with soft tortillas. For a vegetarian version, simply omit the chorizo or add mushrooms. If making ahead, prep and cook your onions and chorizo, make the salsa and shred the cheese. But leave the stove magic for show time. Reheating the queso will alter its consistency. I don’t know what it is about this time of the year, but I totally start craving Mexican food. And Corona. I’ll go buy a 12-pack of Coronas, and it will end up lasting me all summer because I’ll drink a couple now…and then I’ll be over it. But I’m definitely not going to be over this amazing queso. I kinda want to eat it with a spoon. Is that allowed? And I love the sausage addition in there (hah…sausage!). I love Cinco de Mayo.. seriously any excuse to eat all the Mexican food possible and I’ll take it! 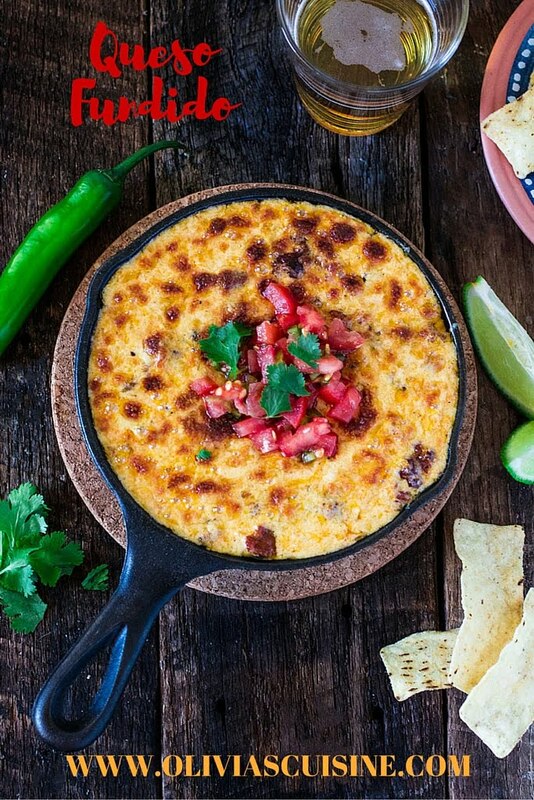 Queso Fundido is a MUST for any Mexican themed celebration and yours looks deeeelish! Cheezy, decadent perfection! I’ll take a vat please! ;) Cheers, girlie! What a great way to celebrate Cinco de Mayo. My friends and I would absolutely devour this. I love that you’ve added sharp cheddar. The flavor combination must be incredible, cheesy perfection! I must not be a Chorizo fan, I did not like this at all. I love cheese fondue and gooey gooey Brie. I also did not ike the consistency of the mixture. It was too clumpy and curdly. Oh no, Kathy! I’m so sorry you didn’t love it. You can definitely make it without the chorizo. As for the consistency, your cheese probably separated (curdled). I would cook in a lower temperature and would stir more often. Also, serve it as soon as the cheese melts. If you overcook it, it will curdle! I hope that helps!